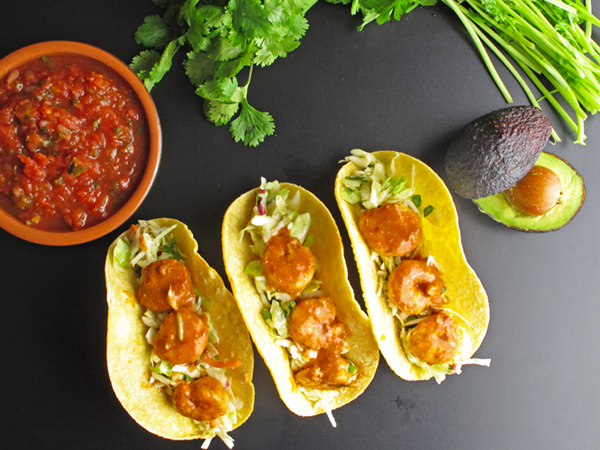 These Speedy Shrimp Tacos are sure to please the whole family on Taco Tuesday or any night of the week! It’s officially Taco Tuesday, but if you ask me tacos are a perfectly good dinner any night of the week! And that is this month’s Recipe Redux theme – Taco Tuesday. Tacos are the perfect family dinner because everyone can customize their own around a main ingredient and get it just the way they like it. We also love it because they tend to be pretty fast meals to put together. 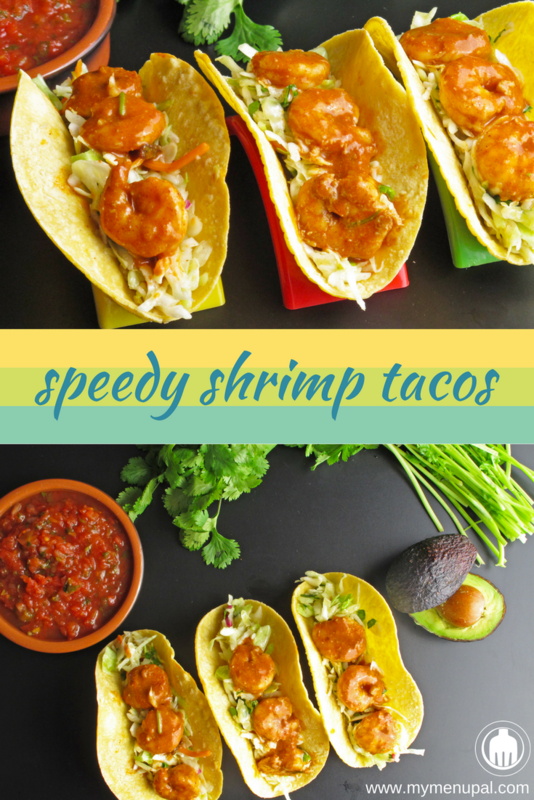 And none can be faster than our Speedy Shrimp Tacos! Shrimp already cooks super fast and when you pair it with some spices and canned enchilada sauce, dinner is on the table in a hurry. Of course if you don’t have any enchilada sauce on hand or just want to make your own, it is really easy to do with some pantry staples. We like this recipe for Homemade Enchilada Sauce from our friend Jodi at Create Kids Club. We actually like to make extra and serve the shrimp over rice the next night for another meal. 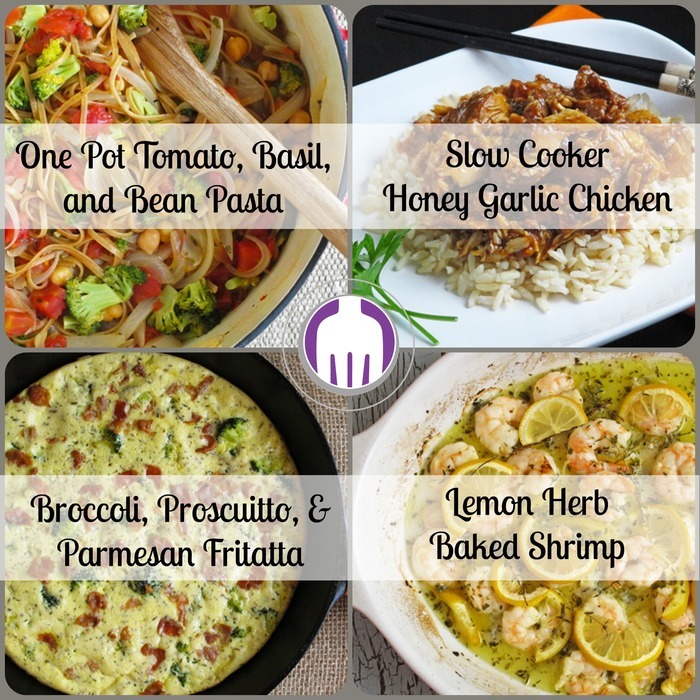 Can’t beat cook once, use twice meals! We personally think that no taco is complete without a little crunch (besides the taco shell if hard tacos are your thing). So we serve the shrimp in tortillas on a bed of our Mexican Coleslaw. Using bagged coleslaw mix, this whips up in no time, though we generally prefer to make the coleslaw ahead of time to bring out the flavors even more. 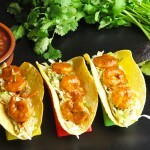 Make our Mexican Coleslaw (find the link below in the recipe notes) for the taco filling to go along with the shrimp. Toss shrimp with cumin and coriander. Add the shrimp to the pan and cook until opaque, about 2 to 3 minutes. Reduce heat to low and pour in the enchilada sauce, stirring to combine. Cook for another minute or two, until heated through and then remove from heat. 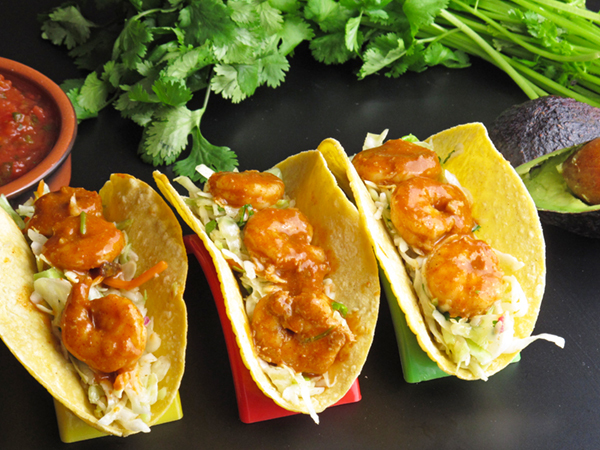 Serve the shrimp with warm tortillas, Mexican coleslaw, salsa, avocado slices, and lime wedges. Meanwhile, in a large bowl, whisk together cilantro, vinegar, oil and salt and cumin. Add cabbage and carrots; toss well to coat. Chef’s Note: To kick up the flavor of the coleslaw, add a little chili powder or smoked Spanish paprika. 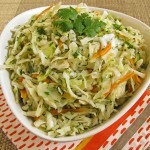 Simplify It: Use a 1-lb bag of prepared coleslaw from the produce section in place of the cabbage and carrots above. 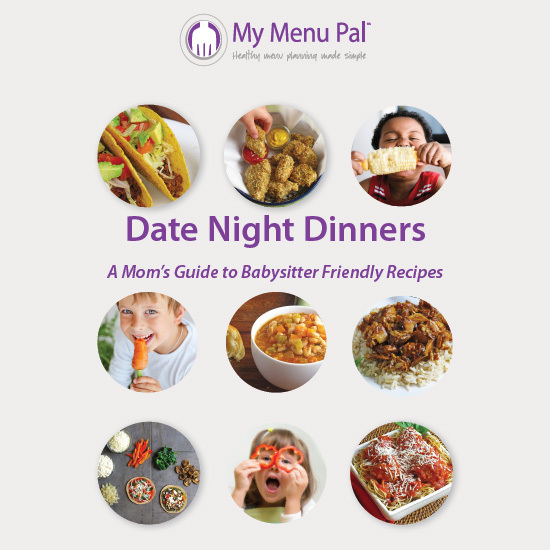 Be Sure To Check Out the Other Recipe Redux Taco Tuesday Creations!